The apartment is renovated and furnished. The kitchen is equipped with appliances: fridge, stove, washing machine. The bathroom has a shower, toilet and bidet. There is a small balcony too. 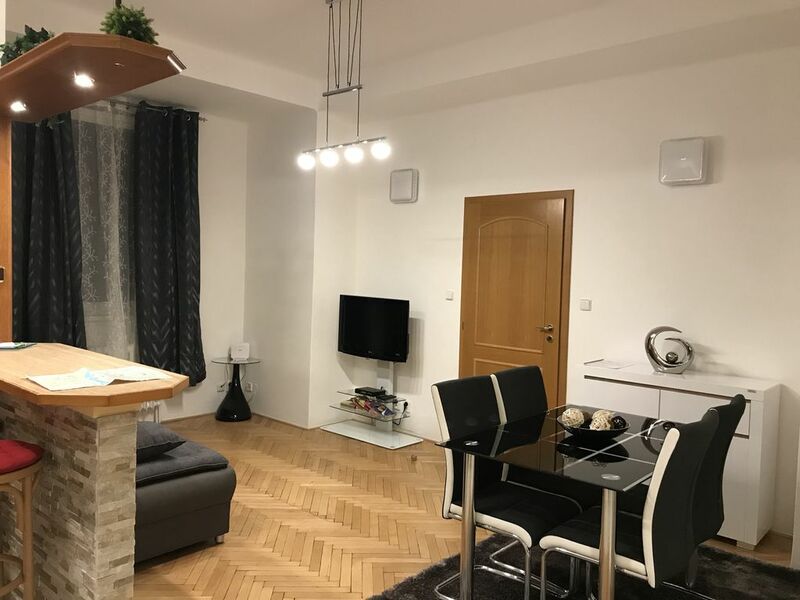 The house is located near the city center, in the prestigious residential Vinohrady district. Not far away are trams and buses. You can easily reach Wenceslas Square and the National Museum in about 5 minutes by walk. Very good location with direct and excellent access anywhere in 5 minutes. Tram Number 22 in Namesti Miru Station for the Old Town, the lower part of Wenceslas Square, Mala Strana and the Castle arrives all the day every 4/5 minutes. Metro, Bus and Tram Station in Namesti Miru is 200m far from the apartment. Metro Station Muzeum, the National Museum and Wenceslas Square are 350m far from the apartment. Metro, Bus and Tram Station in IP Pavlova is 350m far from the apartment. Tram stop Number 11 and 13 is 30m far from the apartment. About 40 min far from the airport and about 15 minutes far from the main train station. Easy and direct access to everywhere in few minutes. very nice apartment,close to town,had a great time. Wonderful location and comfortable place! This apartment was fantastic! We loved the location--walking distance to most of the places we wanted to go and easy metro and tram access when we were tired of walking. All of the traveling essentials were nearby (ATM, groceries, restaurants) and our hosts were extremely helpful. The apartment was comfortable and very quiet (on an inner courtyard not facing the street) and had an elevator. We can't say enough good things about it and recommend it highly! This was a beautiful and comfortable apartment. Antonio and Valentina met us at the apartment and provided us with great information about the area. When showing us how the appliances worked Antonio saw the stove was not working. Immediately they got us a hot plate to use until the stove was replaced the next day. I highly recommend this apartment and would stay again if we ever get back to Prague. We were greeted promptly on our arrival by a representative of new-prague-apartments, Antonio and Valenta both being otherwise engaged. As we happened to be early, we had a coffee at the bookshop/restaurant next door (No.13) which cost only half what we later paid a few streets away in the central district. The apartment has everything you might require, including toiletries and washing up liquid with a small peaceful balcony, facing to the rear of the building. Very comfy bed. The green tube line, the 22 tram and a small supermarket are all a short walk away near Namest Miru church park. However this is uphill from the apartment and, if you are leaving with luggage, it is much better to go downhill to the Museum tube stop, where a lift can take you straight to the green line platform, with easy transfer to the red line if required. It was all so comfortable and convenient that we wished we had booked for a longer visit! Wonderful place to stay. Located in a quiet residence, yet only a few minutes walk from a tram or tube into the centre. Antonio and Valentina were excellent hosts from the start to the end of our holiday. So clean it sparkled, tastefully decorated, handy to the metro and tram, quiet neighborhood. We were so lucky to find such a nice VRBO!